If we intend to model all the information we have identified, we will need a Metamodel, aka a list of Entities and their Relationships of the things that we will model. It would be nice to choose one, however in reality, one Metamodel to cover the entire Transformation domain does not exist and so a hybrid approach is needed. Here we see an example of a full hybrid meta-model, constructed by taking the most appropriate things from various meta-models from various frameworks, and producing a meta-model with 100% coverage. We say 100% coverage because it covers both Structural and Transformational information, from a Strategy to Deployment perspective. You may be surprised that the part that Pragmatic contributes (in red) is so small. This is perfectly understandable as Pragmatic have always asserted that lack of meta-models has rarely been the reason for EA’s failure and since there are already a multitude of Metamodels already in existence it would be churlish to re-invent the wheel so to speak. Pragmatic has, however, made a massive contribution by the introduction of Transformation Debt™ Agreements (TDAs) that allow the exposing and management of Transformation Debt™. In addition Pragmatic’s contribution is by the definition of the Ontology that all these other frameworks co-exist within, aka DOTS, MACE and MAGMA. 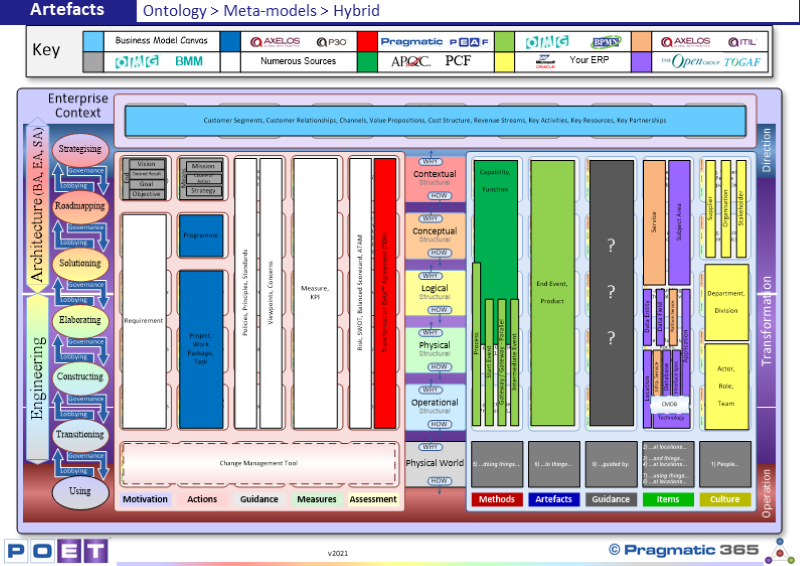 Having said that, it has become obvious over time, that the lack of a single coherent metamodel, coupled with the difficulty most tools have in using hybrid metamodels, creates a massive problem for Enterprise and therefore a full Pragmatic Metamodel is in production, which will cover all domains and all levels. What Hybrid Meta-model are you currently using? Is this a good starting point for a complete and Pragmatic meta-model? Who could create such a hybrid meta-model? How would you implement such a hybrid meta-model? How long would it take to create? Are there any tools that can implement and utilise Hybrid Meta-models?